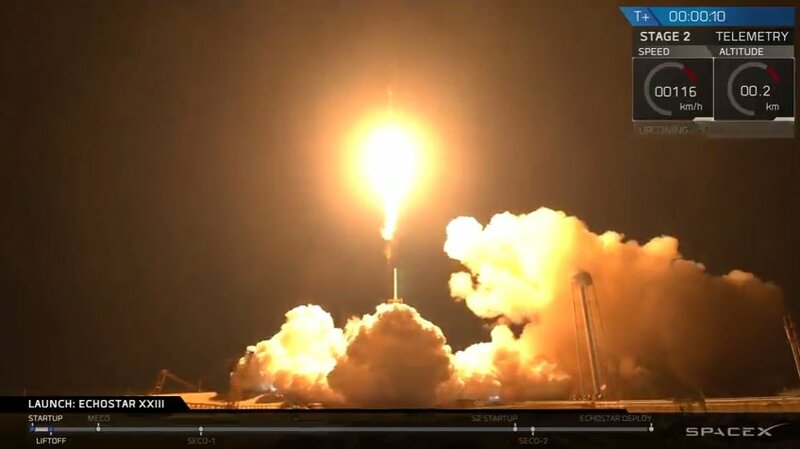 CAPE CANAVERAL, Florida -- Space Exploration Technologies (SpaceX) successfully launched a Falcon 9 rocket carrying an EchoStar-23 television broadcast satellite at 2:00 a.m. Eastern Standard Time on Thursday, March 16, 2017, from Launch Complex 39A at the Kennedy Space Center in Florida. Approximately 30 minutes after launch, the satellite was deployed in its intended orbit. This was SpaceX's second launch from the historic Space Shuttle and Apollo launch site. There was not an attempted landing of the Falcon 9 first stage after the launch. EchoStar XXIII is a highly flexible, Ku-band broadcast satellite services (BSS) satellite with four main reflectors and multiple sub-reflectors supporting multiple mission profiles. Initial commercial deployment of EchoStar XXIII will be at 45° West which will provide direct-to-home television broadcast services to Brazil for the next 15 years. Colorado-based EchoStar operates the world’s fourth-largest commercial geosynchronous fleet with 25 satellites.